To develop a volumetric display of the kind we see in science fiction movies is a dream of many display researchers, including us. Here, we show a new volumetric display with microbubble voxels. The microbubbles are three-dimensionally generated in liquid by focused femtosecond laser pulses. The use of a high-viscosity liquid, which is a key part of the development of this idea, slows down the movement of the microbubbles, and, as a result, volumetric graphics can be displayed. This volumetric bubble display has a wide-angle view, simple refreshing, and no addressing wires, since the transparent liquid is accessed optically rather than electronically. It achieves full-color graphics composed of light-scattering voxels controlled by illumination light sources. Furthermore, a holographic laser drawing method based on a computer-generated hologram displayed on a liquid-crystal spatial light modulator controls the light intensity of the microbubble voxels with an increase in the number of voxels per unit time and the spatial shaping of the voxels. B. G. Blundell and A. J. Schwarz, “The classification of volumetric display systems: Characteristics and predictability of the image space,” IEEE Trans. Vis. Comput. Graph. 8, 66–75 (2002). S. Tay, P.-A. Blanche, R. Voorakaranam, A. V. Tunc, W. Lin, S. Rokutanda, T. Gu, D. Flores, P. Wang, G. Li, P. Sr Hilaire, J. Thomas, R. A. Norwood, M. Yamamoto, and N. Peyghambarian, “An updatable holographic three-dimensional display,” Nat. Lett. 451, 694–698 (2008). J. Son, B. Lee, O. Chernyshov, K. Moon, and H. Lee, “Holographic display based on a spatial DMD array,” Opt. Lett. 38, 3173–3176 (2013). T. Kozacki and M. Chlipala, “Color holographic display with white light LED source and single phase only SLM,” Opt. Express. 24, 2189–2199 (2016). G. E. Favalora, J. Napoli, D. M. Hall, R. K. Dorval, M. G. Giovinco, M. J. Richmond, and W. S. Chun, “100 Million-voxel volumetric display,” Proc. SPIE 4712, 300–312 (2002). A. Jones, I. McDowall, H. Yamada, M. Bolas, and P. Debevec, “Rendering for an interactive 360° light field display,” ACM Trans. Graph. 26, 1–10 (2007). P. C. Barnum, S. G. Narasimhan, and T. kanade, “A multi-layered display with water drops,” ACM Trans. Graph. 29, 1–7 (2010). I. Rakkolainen, S. DiVerdi, A. Olwal, N. Candussi, T. Hüllerer, M. Laitinen, M. Piirto, and K. Palovuori, “The interactive FogScreen,” in Proceedings of ACM SIGGRAPH 2005 Emerging Technologies (ACM, 2010), p. 8. Y. Ochiai, T. Hoshi, and J. Rekimoto, “Pixie dust: Graphics generated by levitated and animated objects in computational acoustic-potential field,” ACM Trans. Graph. 33, 1–13 (2014). D. L. MacFarlane, “A volumetric three dimensional display,” Appl. Opt. 33, 7453–7457 (1994). H. Kimura, T. Uchiyama, and H. Yoshikawa, “Laser produced 3D display in the air,” in Proceeding of ACM SIGGRAPH 2006 Emerging Technologies (ACM, 2006), p. 20. H. Kimura, A. Asano, I. Fujishiro, A. Nakatani, and H. Watanabe, “True 3D display,” in Proceeding of ACM SIGGRAPH 2011 Emerging Technologies (ACM, 2011), p. 10. Y. Ochiai, K. Kumagai, T. Hoshi, J. Rekimoto, S. Hasegawa, and Y. Hayasaki, “Fairy lights in femtoseconds: aerial and volumetric graphics rendered by focused femtosecond laser combined with computational holographic fields,” ACM Trans. Graph. 35, 1–14 (2016). I. T. Lima, “Volumetric display based on two-photon absorption in quantum dot dispersions,” J. Display Technol. 6, 221–228 (2010). R. Hirayama, M. Naruse, H. Nakayama, N. Tate, A. Shiraki, T. Kakue, T. Shimobaba, M. Ohtsu, and T. Ito, “Design, implementation and characterization of quantum-dot-based volumetric display,” Sci. Rep. 5, 8472 (2015). E. Downing, L. Hesselink, J. Ralston, and R. Macfarlane, “A three-color, solid-state, three dimensional display,” Science 273, 1185–1189 (1996). T. Honda, T. Doumuki, L. Galambos, and L. Hesselink, “One-color one-beam pumping of Er3+- doped ZBLAN glasses for a three-dimensional twostep excitation display,” Opt. Lett. 23, 1108–1110 (1998). K. Langhans, C. Guill, E. Rieper, K. Oltmann, and D. Bahr, “Solid felix: A static volume 3D-laser display,” Proc. SPIE 5006, 161–174 (2003). 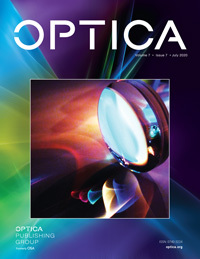 K. Kumagai, D. Suzuki, S. Hasegawa, and Y. Hayasaki, “Volumetric display with holographic parallel optical access and multilayer fluorescent screen,” Opt. Lett. 40, 3356–3359 (2015). Y. Hayasaki, T. Sugimoto, A. Takita, and N. Nishida, “Variable holographic femtosecond laser processing by use of a spatial light modulator,” Appl. Phys. Lett. 87, 031101 (2005). S. Hasegawa, K. Shiono, and Y. Hayasaki, “Femtosecond laser processing with a holographic line-shaped beam,” Opt. Express 23, 23185–23194 (2015). A. Vogel, J. Noack, K. Nahen, D. Theisen, S. Busch, U. Parlitz, D. X. Hammer, G. D. Noojin, B. A. Rockwell, and R. Birngruber, “Energy balance of optical breakdown in water at nanosecond to femtosecond time scales,” Appl. Phys. B 68, 271–280 (1999). C. B. Schaffer, N. Nishimura, E. N. Glezer, A. M.-T. Kim, and E. Mazur, “Dynamics of femtosecond laser-induced breakdown in water from femtoseconds to microseconds,” Opt. Express 10, 196–203 (2002). Y. Hosokawa, H. Takabayashi, S. Miura, C. Shukunami, Y. Hiraki, and H. Masuhara, “Nondestructive isolation of single cultured animal cells by femtosecond laser-induced shockwave,” Appl. Phys. A 79, 795–798 (2004). S. J. Lee and S. Kim, “Simultaneous measurement of size and velocity of microbubbles moving in an opaque tube using an X-ray particle tracking velocimetry technique,” Exp. Fluids 39, 492–497 (2005). J. Bengtsson, “Kinoform design with an optimal-rotation-angle method,” Appl. Opt. 33, 6879–6884 (1994). A. Stone, H. Jain, V. Dierolf, M. Sakakura, Y. Shimotsuma, K. Miura, and K. Hirao, “Multilayer aberration correction for depth-independent three-dimensional crystal growth in glass by femtosecond laser heating,” J. Opt. Soc. Am. B 30, 1234–1240 (2013). Fig. 1. Concept of volumetric bubble display. Various volumetric graphics rendered by bubbles can be viewed from any direction. Fig. 2. Rising velocity versus diameter of microbubble. Experimental data points (black dots) are fitted with a power function of the diameter D (black line). The red line is the theoretical rising velocity of the microbubbles, given by Eq. (1), where μ=0.276 Pa·s and Δρ=1238 kg/m3 at 50°C. Fig. 4. (a) Optical setup for observing the microbubble generation area along the axial direction of the femtosecond laser-induced microbubbles. (b) Generation length versus the energy of irradiated pulses with a single shot. (c) Microbubbles created with irradiation energies of 0.9 (top), 3.2 (middle), and 8.2 (bottom) μJ. Fig. 5. (a) Generation length versus the energy of irradiated pulses with multiple shots. (b) Microbubbles created with an irradiated pulse energy of 3 μJ. Fig. 6. (a) Macro (top) and magnified (bottom) images of a voxel created with the holographic laser drawing method (four accesses). (b) Intensity of a voxel versus the number of parallel beams. Fig. 7. Image sequence of 2D graphics image known as “Mermaid” rendered by femtosecond laser-induced microbubbles with pulse energies of 4.3 μJ (top) and 8.6 μJ (bottom) (see Visualization 1). Fig. 8. Volumetric graphics of “Stanford bunny” rendered by femtosecond laser-induced microbubbles (see Visualization 2). Fig. 9. 2D bubble graphics of “Dolphin” with illumination lights having different colors (see Visualization 3).